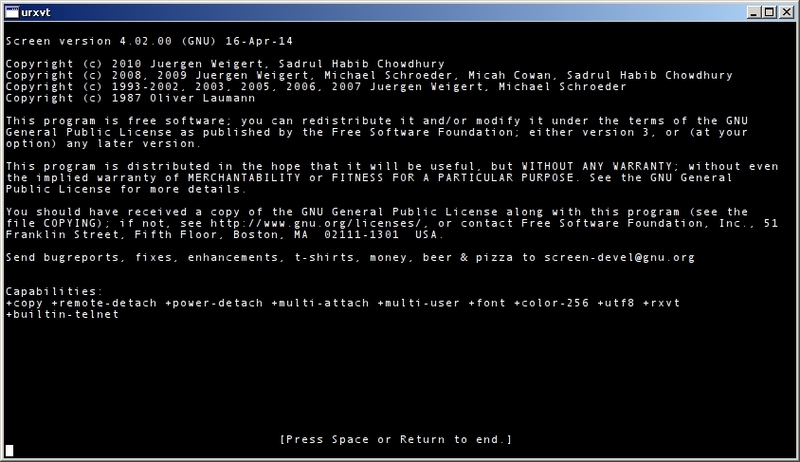 I was for a very long time a faithful user of GNU screen. That has mellowed somewhat over the past few years, partly because tmux — I must admit — is leaps and bounds beyond what screen can do, but also just because there are other options too. Things like dvtm, or even twin, which both handle the concept of multiple-terminals-one-screen in their own fashion. Any of those three can do … somewhat something similar to what screen does, and have probably all seen more improvements over the years than screen. Postscript, 2014-04-20: Wouldn’t you know it, only a day after whining about years without updates, this trickles down the pipe to my lowly Arch install. This entry was posted in Linux and tagged manage, multiplexer, process, terminal, tty on 2014/04/19 by K.Mandla. I have screenify on my list, and I think it’s a little out-of-order to speak of it before recapping screen proper. And since screenify strikes me as a little less than practical, I’ll just skim through it. There isn’t much to show anyway. screenify should do much like what reptyr does — yank a running process into another terminal, but I haven’t met with much success. Documentation is very scant for screenify. I got it to work once, basically following the crude steps in this zsh mailing list reply, but it hasn’t worked since then. 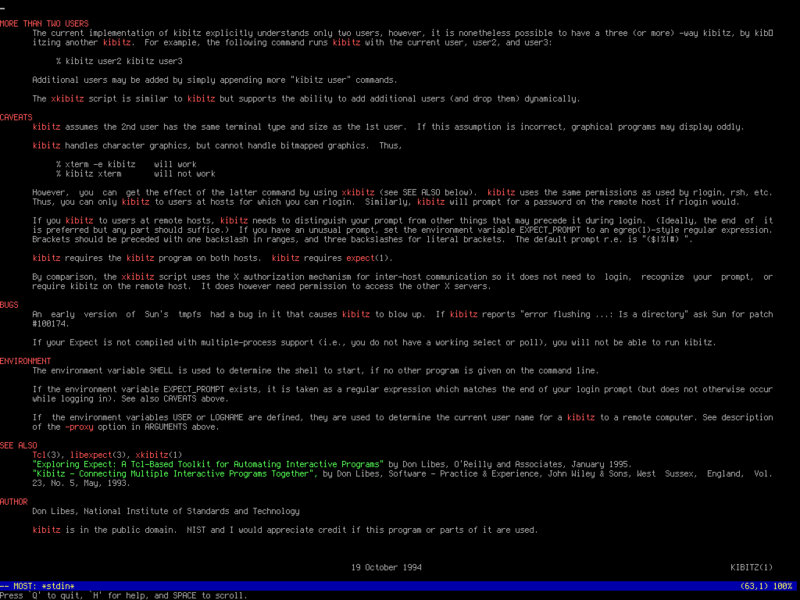 Start your process in one terminal. Use CTRL+Z to pause it. Then disown the process, which should free your terminal and if you’re lucky, show the PID of the free-spinning process. If not, check top or another tool. Now from within screen, use screenify PID and you’ll get some rambling text along with a confirmation. From yet another shell, issue kill -CONT PID, which should redirect the output into your screen session. Like I said, it worked for me once, but never again. Just dumb luck, I guess. And processes other than very simple, single-PID, non-console-applications don’t seem to follow through. In other words, bc, htop and alpine all refused to jump between terminals for me. This entry was posted in Linux and tagged manage, process, tty on 2014/04/19 by K.Mandla. reptyr should allow you to detach a process from a tty session and yoink it into another one … if I understand the underlying idea. So with bc running on one tty, I can yank it to the other by feeding its PID to reptyr. Essentially you get a similar effect as you might with screen or tmux, detaching and allowing the process to continue, but freeing up the original tty. I can see where this would be very useful for applications you started without screen/tmux, then don’t want to end. and without it, all I got were error messages. In addition, as you can see in the gif, there seem to be some issues with typed text not showing up in the receiving terminal. I’ll look into that, and see if there’s a way around it. 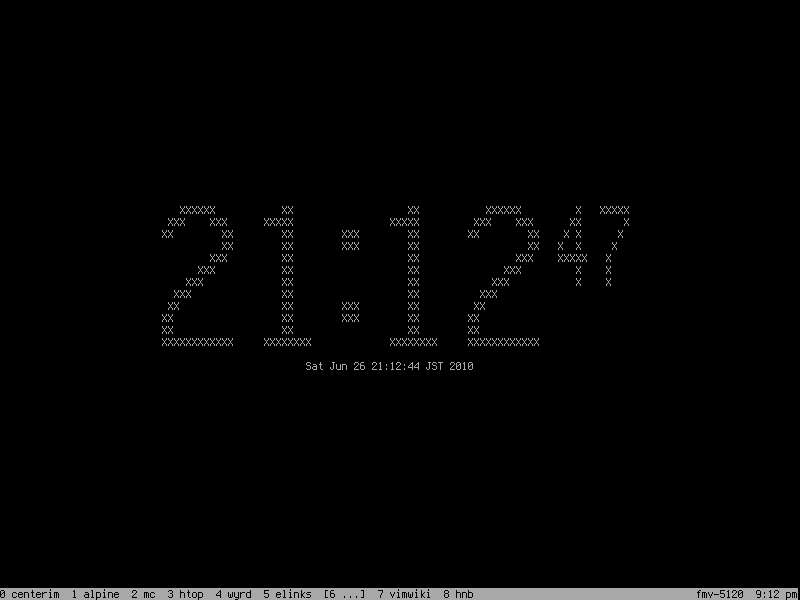 But some applications, like htop, happily jumped from one terminal to another, without skipping a beat. mc jumped, but didn’t refresh the screen until I pressed a key. bc, as you can see, seemed to respond, but lost its echoed text. It still showed results, just not the text I entered. Those small quirks aside, and from the perspective of pure function, this is definitely a keeper. For all the times I’ve ever had to quit one session and move to another, and start over, reptyr would have saved me the trouble. This entry was posted in Linux and tagged manage, process, tty on 2014/04/03 by K.Mandla. Buried in a package called expect is a utility that seems to have a lot of potential: kibitz. If I understand it correctly, it should allow two users to piggyback in the same shell, watching each other type and offering help when necessary. For me, it didn’t seem to want to work; I tried to kibitz from root to the kmandla account, but kept getting “write permission” messages. I think I understand how it should work though, and I like the idea, generally speaking. Although two people typing in the same shell sounds like a recipe for a wheel war. This entry was posted in Linux and tagged share, shell, terminal, tty on 2013/12/15 by K.Mandla.